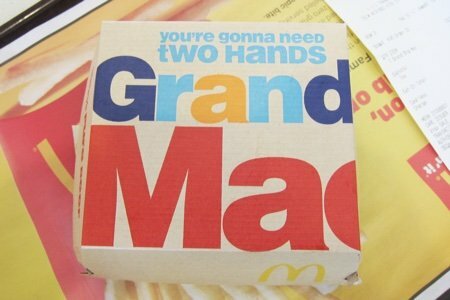 I believe I was watching the Super Bowl when I saw an advertisement for McDonald’s Grand Mac. McDonald’s has been on the right track in my opinion. They started putting kale in their salads, serve Mandarin oranges in their Happy Meals, and you can get the Egg McMuffin all day (one of their best offerings if you leave off the cheese and ham). I have hope that since they feed so many people every day, they would continue to move toward healthier food. My thinking is that more people are becoming aware of how diet affects their overall health. The Grand Mac is a move in the wrong direction. I thought that after the “Super Size Me” documentary that they would get away from making things bigger. 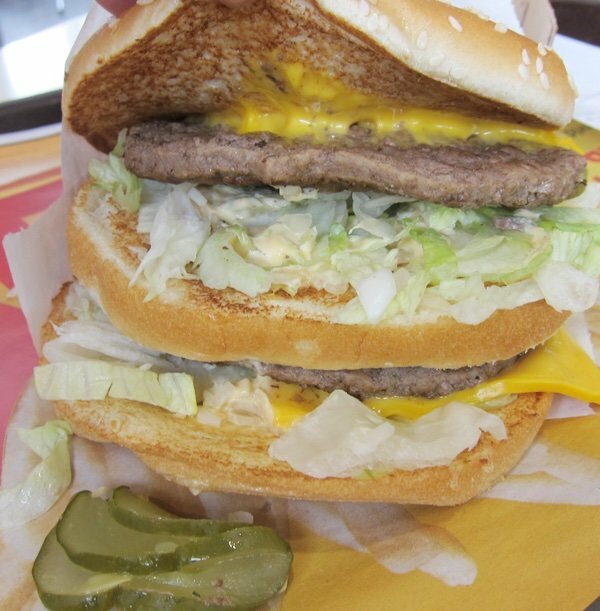 This is what happens when you make the BIG Mac (an already large sandwich) bigger. It can’t stand up it is so big and you won’t be able to stand up either after you eat it! Fifty two grams of fat in one burger! You can’t make this stuff up. What really blew my mind wasn’t the nutritional facts – it was the look of it and the taste. I went ahead and ate some of it because I thought it would taste good. I mean how can you go wrong with 52 grams of fat? But, it tasted like Styrofoam soaked in grease. The taste of chemicals was overwhelming and all I could taste was this bitter, strange flavor that stayed in my mouth WAY after I tried it. It tasted absolutely terrible. I took a look at the ingredients and found that there were many chemicals used to make the thing. Wow! This list is crazy. I knew the stuff was bad but I had no idea how many things like “Propylene Glycol Alginate” was in the sauce. It tastes like this list – full of chemicals. Whatever you do, do not encourage McDonald’s by buying this burger. I asked the McDonald's staff if anyone orders it (or if they had tried it). Not one of the workers at my closest McDonald’s had tried it. One worker said he would eat it if he had time to run a marathon after he consumed it. Wow, that looks really gross. I thought perhaps this is their BK Whopper competitor, so I started comparing their nutritional info, and the Grand Mac is worse. This is disappointing, McDonalds! Gross! That burger looks disgusting! You can make way healthier burgers at home. They taste better and you can even make a makeshift big Mac. That burger just looks so blah! Yes Kelly, make your own! Always tastes the way you want! I agree that this sandwich is a health-goal disaster; but so is fast-food! People go to McDonalds because they do what they do very well....burgers and fries. Rather than shaming them and hoping they'll tweak their offerings into healthier versions, I think we should either have a child's size (Happy Meal) or even better, stay away from it all together. While I would agree that McDonald's is not the place to go if you're trying to get healthy, it's a quick fix and should be enjoyed in moderation...that means maybe 3 or times per year. That being said, every other fast food restaurant is just as bad. I'm pretty sure Burger King and Wendy's aren't great choices either along with subway (it's all processed meats!) When I want a delicious burger I go to a place that serves gourmet homemade burgers and homemade fries and I don't feel guilty either. It's not the once a month habits but the daily choices that really affect our health. Mine was mostly sauce and lettuce and yes it slid all over. On the day after the Super Bowl the mcD app had a free Grand Mac coupon. I was curious and couldn't pass up a free almost $6 sandwich! I ate the entire thing, and enjoyed it! All while knowing it was a one time treat and I would never buy it again. I do frequent Mcdonalds for their unsweetened iced tea though! I've seen advertisements for this burger, but I'm not a fan of huge burgers; I won't be trying it. While I think it is great that so many sites have taken to informing the public of McDonald's unhealthy options,I don't think anyone really orders the crap food there expecting it to be healthy. When I want some really fattening, bad for me, sometimes rather tasty food, I go to McDonald's or somewhere of the like. If I'm on the road, having missed a meal, and I need a healthy meal option, I still hit up McDonald's. McDonald's tries to cater to what the public wants. Since customers have been harping on them to offer healthier food options, they have met and are meeting that demand. I appreciate the variety they offer, healthy and unhealthy. By now, most everyone knows you can't eat crappy food and expect good health. As far as the documentary mentioned, Morgan could have most certainly eaten thirty days at McDonald's without all the complications had he chosen healthier food options. All of this is to say that, people go to McDonald's knowing full well what they serve and what they want to eat; McDonald's business is to provide the public with what they desire to eat for the sole purpose of making a financial profit. We all know the food looks like crap and sometimes tastes like crap, but when we want it, we want it. If I don't want to be subject to sometimes crappy food, I keep my money and cook at home. My meals are healthy, delicious, and not sloppy. Thanks for the heads up snack girl... I asked yahoo how I should order my Grand Mac, and it brought me to your website! Right now I'm in the mood for something that will make it hard to stand up- and for only 6$?? It's a no brainer for me, give me 2 Grand Mac's with extra mac sauce- large size baby! I am going to get on my SOAP BOX. Buying food at a Fast Food Restaurant (especially McDonald's) is a choice (the wrong one)! You the consumer knows it's a BAD choice!! COME ON!!!! The consumers who are complaining about the unhealthy foods that are out there in the fast food world are in denial trying to blame the FAST FOOD Industry for their ill health and obesity. McDonald's, Burger King, Arby's, etc, are not going to stay in business selling salads with no salad dressing, kale, spinach, baked fish, bland chicken breast, etc. We, the consumers, need to get off our duffs, grocery shop for healthy foods and get in our kitchens and cook what is healthy for ourselves and our families. Stop blaming the fast food industry for making the USofA fat. YOU HAVE CHOICES. There is not a good enough reason for people to claim that they don't have enough time to buy the groceries, look up a recipe, and cook a meal in their OWN KITCHENs. If being healthy and happy and living w/o health problems is not enough good reason, then I don't know what is? Get off the cell phone, tablet, computer, and couch and get to cooking. What you paid for that BIG MAC can get you at least 5 healthy meals at home with your family or friends. YOU take control of your life and what you put in your mouth and on your hips. I will now climb off my soap box. Yup, we tried it! I don't ever eat the bread so I figure more meat. That ain't meat, no way! On top of that, it was mostly bread. Just nastiness in a box. For a long time I could not understand why fast-food burgers tasted yummier than home made - discovered it's the sugar overloaded sauce. Make your own and save your body. I make my own now but still feel that addict-draw to the drive-thru. You know what's even worse? Hardee’s Monster Thickburger: 1,340 calories, 34 grams of saturated fat! 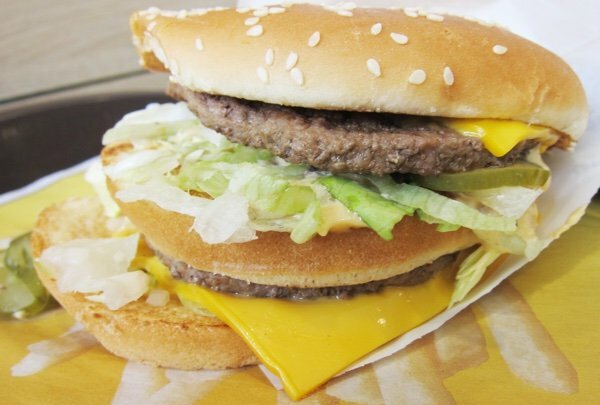 NOTHING from the Fast Food giants is EVER healthy...and the Grand Mac is gross. The meat is low quality, veg lower quality, sauce is heavily sugar laden...that leaves the bread. McD's "bread" has less nutritional valve that a paper napkin. Fast Food should be a "treat" like no more that once-a-month and I'd steer clear of the Grand Mac. I'm McHatin' it!